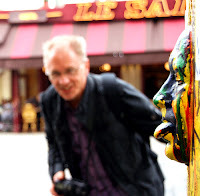 Sab's Secret Paris: 400 Quirks No.7 ~ "Walk Like An Egyptian"
400 Quirks No.7 ~ "Walk Like An Egyptian"
JOIN IN THE FUN ~ CHAT ABOUT QUIRK NO.7! In a typical little Paris split in the road, somewhat off the beaten track, sit yourself down on the bench and cast your eyes around. You'll find you're being watched from above your head by some rather unusual faces. Let's get a bit of context first. We're right next to the reputedly longest covered walkway in the city, the Passage de Caire. We're sitting in the Place du Caire. We're near the junction of Rue des Forges and... Rue du Caire. If you're getting the idea that there's a certain Egyptian feel to the area you wouldn't be wrong. 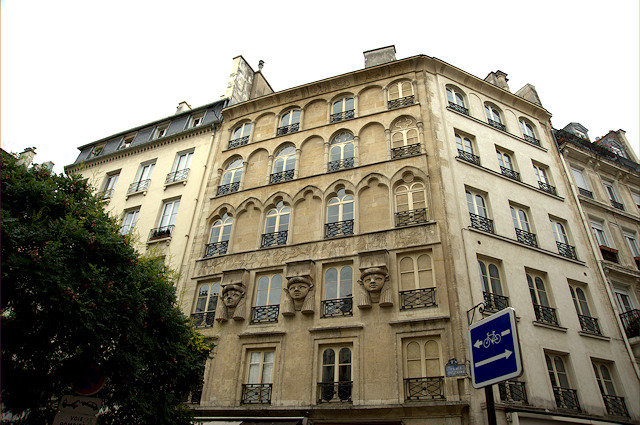 Around one corner you'll find the Rue d'Alexandrie, and around another the Rue d'Aboukir. But these exotic names are not the most exotic aspect of this area. Back in 1798 the future emperor Napoleon Bonaparte was about to pop off on his Egyptian Campaign, so things middle eastern were somewhat in the air. 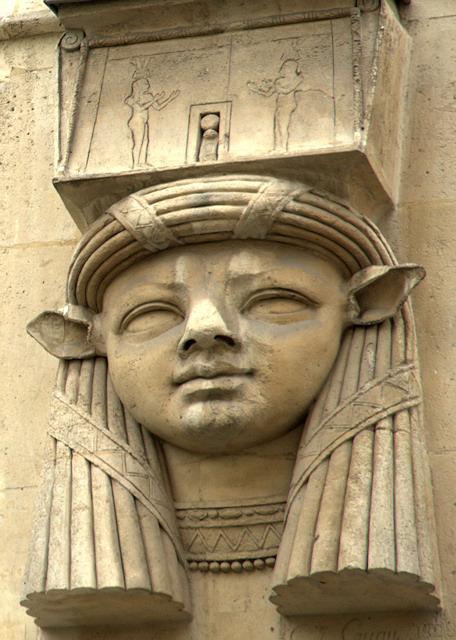 The Passage du Caire was supposed to be like a nod to the great souk of Cairo, but in the end was criticised for not being souklike one little bit. The architect of the building in these pictures, constructed around 1828, however, let his imagination run a little wilder. 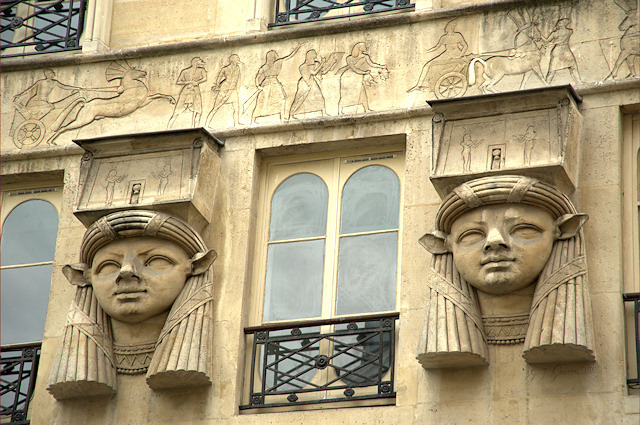 Up between the windows of the second floor we are treated to three enormous heads of the goddess Hathor, I do believe. This is surmounted by a beautiful strip of chariots and horses, and the architecture is highly influence from the near-orient, with decorated columns and hieroglyphs and lotus bud motifs and the like. It's great! We're not done with the weirdness, though. 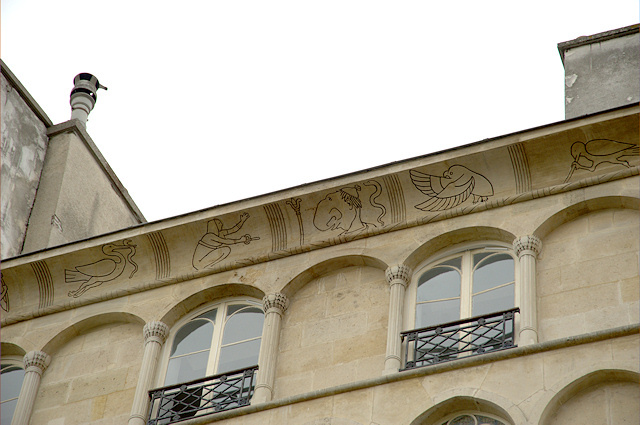 If you look even further up, to the cornice, which is the bit just under the roof, curving in (or out, depending on which direction you're coming from), you'll see a particularly strange hieroglyph indeed. right in the middle most certainly isn't. What we see is a representation of a man with a huge nose pretty much the size of his actual head. 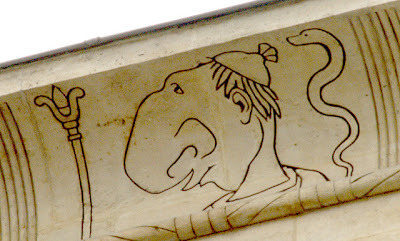 It's actually a caricature of a painter called Antoine Bouginier, whose extraordinary facial features earned him the right to be joked about visually all over the city. This is the last remaining vestige of this unfortunate notoriety, although there is a reference to him in Les Miserables by Victor Hugo too! 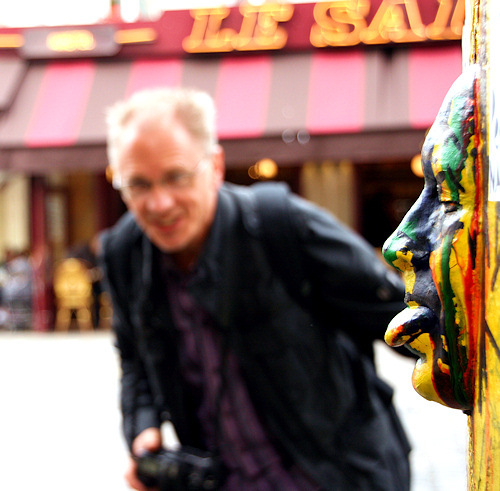 Paris is always showing its teeth; when it is not scolding it is laughing." I ask myself if, given the choice, I would prefer to have a particularly unflattering personal characteristic of mine graffitied all over the capital and mentioned in a future classic of literature, or simply sink into oblivion with so many other would-be greats but with my pride in tact. Presumably it will be the latter fate which befalls me, so I'll have to try and live with it, and you can simply speculate away the wee hours wondering just how big my nose actually is...It was just recently, in fact, after many years in Paris that I eventually made it to the famous 'museum of the city of Paris', the legendary and rather poetic-sounding Musée Carnavalet.